Watford XI: Gomes, Nyom, Cathcart, Britos, Ake, Capoue, Watson, Abdi, Deeney, Jurado, Ighalo. "Lots of noise about Deeney and Ighalo and the way they play, but from Sunderland's perspective how disappointing, This would have been a game they were targeting for a win." No. It's all over and Watford have won, again. For reaction from the Stadium of Light, go here. Watford break up the other end and Odion Ighalo could seal it... but no, he dithers and is denied by Costel Pantilimon. Will it matter? The ball keeps being hoisted into the Watford area. They are desperate for the final whistle. You guessed it, another Sunderland attack, another near-miss. This time Adam Johnson pounces on a bouncing ball at the far post but sends his first-time shot wide. Time is running out for the Black Cats. Sunderland go close again. Jermain Defoe gets on the end of Patrick van Aanholt's bouncing ball into the box but his deft touch diverts it the wrong side of the post. Watford are hanging on here, but they are still dangerous on the break. Odion Ighalo runs clear and can wrap it up but Seb Coates gets back and forces him to shoot wide. Great defending. Heurelho Gomes knew this one was going in. Jermain Defoe embarks on a winding run inside the Watford box but his low shot is brilliantly turned round the post by the Hornets' keeper. Sunderland go close to getting the ball in the net for real - Duncan Watmore looks up on the edge of the box and flashes in a shot that swerves away from goal. Watford keeper Heurelho Gomes was at full stretch - I don't think he knew that was going wide. "Watford have played really well, I've been impressed with their intensity. In Ighalo they have a player who can really change games." Another Watford change. This time Ikechi Anya is on for Jose Manuel Jurado. Jermain Defoe does not take long to make a difference, running on to Adam Johnson's precise pass before slotting home... but the flag is already up for offside. Johnson has moved to a central position and is seeing more of the ball. Here comes Sam Allardyce's last throw of the dice - Jermain Defoe is on for Steven Fletcher in Sunderland's final substitution. 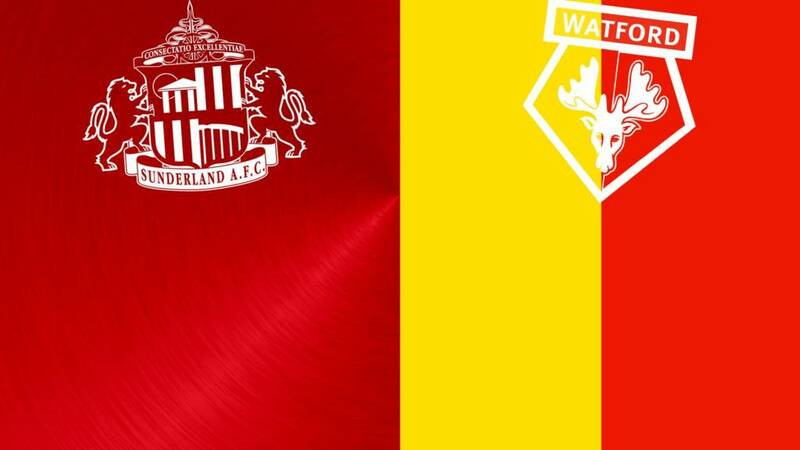 A first change by Watford - Almen Abdi is replaced by Adlene Guedioura. The Hornets only have to hold out for another 20 minutes to secure their third successive Premier League win. Watford have been under the cosh since the interval but have just shown how quickly they can break when they get the chance - only a poor final ball let them down. Sunderland have to be careful here. Sunderland substitute Jack Rodwell has got his shooting boots on today. He lets fly again, when the ball drops to him inside the area, but sees it curl high and wide of Heurelho Gomes's goal. More Sunderland pressure, more good defending from Watford, who win back possession and end up winning a free-kick when Patrick van Aanholt hacks down Ben Watson - that's a booking for the Sunderland man. Another Sunderland change. Adam Johnson is on for Fabio Borini - Jermain Defoe is taking his coat off too, so he might also be on soon. Watford have seen far less of the ball since the break but they don't seem too rattled so far - they are very well organised on the edge of their own box and are not allowing any balls in from open play. That's probably why another Sunderland attack has just ended with a shot from long range - this time Jack Rodwell's effort ends up in Row Z.
Watford have dealt pretty well with Sunderland's attempts to get the ball into their box so far. No wonder the Black Cats are being forced to try their luck from distance, and Jack Rodwell - who has impressed since coming on - brings a decent stop from Heurelho Gomes. Allan-Romeo Nyom doesn't half cover some ground on the Watford right. He motors forward down that flank again and finds Odion Ighalo in the middle.... but the Hornets striker is offside. Sunderland are first to attack too. Patrick van Aanholt lets fly with a hopeful effort from 30 yards that is so bad it almost ends up being a pass. We are back under way at the Stadium of Light. Sunderland's wide men Duncan Watmore and Fabio Borini appear to have swapped flanks for now - Borini is over on the left. Watford deserve their lead but Sunderland are definitely not out of this one yet. Yann M'Vila swings it in to the box on Big Sam's behalf and Watford defender Miguel Britos inadvertently heads it towards his own goal - forcing Heurelho Gomes to tip over. That goes down as Sunderland's best effort of the first half. Sunderland have not won a home Premier League game from 1-0 down for four years. They have managed nine draws, though, so not all is lost for Black Cats fans. Sunderland are trying to build chances in typical Sam Allardyce style, with long balls up to Steven Fletcher and Billy Jones working hard on the right to get some deliveries into the box. That approach just earned them a corner and, eventually, a decent sight of goal... Heurelho Gomes punched it clear as far as Fabio Borini, who did not make proper contact on the edge of the box and saw his first-time shot fizz wide. Lewis Loyd: Goodness me Watford are sixth in the as it stands table! Sunderland have gone from 5-4-1 to 4-1-4-1 since that early switch, with Billy Jones now at right-back and Ola Toivonen protecting the back four. They look a slightly more solid unit but they are still yet to force Watford keeper Heurelho Gomes into a save. Watford still look much neater in possession, and much more threatening when they cross the halfway line. Sunderland are scrapping well enough but are short of quality in the final third - Jack Rodwell just blazed over from 25 yards out. Meanwhile, Watford continue to look dangerous every time they come forward. The ball breaks to Etienne Capoue on the edge of the area and his low curling shot is pushed away by Costel Pantilimon. Not much of an improvement from Sunderland since that early substitution. Only a long period of head-scratching from Sam Allardyce on the sidelines - impressive. Odion Ighalo was involved in six goals in his last six top-flight appearances (4 goals, 2 assists) before today but I am not sure whether he will be credited with Watford's opener this afternoon - replays seem to suggest Sebastian Coates got the last touch with an outstretched boot. An early change for Sunderland, and it could mean a change of formation. Deandre Yedlin is off, and Jack Rodwell is on. Sam Allardyce has obviously not enjoyed the first few minutes of this game. Better by Sunderland. Fabio Borini spins to make room for a shot on the right of the area and flashes a low effort just wide. Quite a good reason for that, Lucy - Watford signed about 15 players in the summer, which is also when Quique Sanchez Flores took charge. Sunderland defender Billy Jones has just had his side's first shot of the game, letting fly from about 30 yards out. It ended up a similar distance high and wide. Odion Ighalo (26) and Troy Deeney (17) have scored 43 league goals combined in 2015; 11 more than Sunderland have overall this year (32). The Sunderland defence is in tatters. Odion Ighalo left John O'Shea in his wake but could not quite force the ball home. That was followed by a massive goalmouth scramble where the Hornets saw another shot blocked by Costel Pantilimon before Jose Manuel Jurado fired against the post. Here come Watford again, though. Nathan Ake's deep cross finds Almen Abdi at the far post, but he cannot find the target after bringing the ball down nicely under pressure. "It's a good finish, he just ghosts in. It was like a training ground goal, Ighalo makes a good move across Coates and though it almost looks like an own goal, he just gets there first." A decent response from Sunderland, in terms of getting men forward anyway. They are yet to have a shot at goal but they have had a penalty appeal when the ball bounced up and hit Watford defender Craig Cathcart, but it was turned down. "Not what Sunderland needed at all. There had been a feel good factor around the club before today - they've been difficult to score past in recent matches - but they've conceded one already. Perfect start for Watford though." Sunderland boss Sam Allardyce spoke before the game about stopping Odion Ighalo - that didn't go so well, did it? Allan-Romeo Nyom gets down the right and sends in a low cross that Ighalo meets at the near post to beat Costel Pantilimon with a low finish. The keeper should definitely have done better, though. Watford go long to launch the first attack of the game and almost capitalize... Sebastian Coates and John O'Shea failed to deal with it and Odion Ighalo almost got on the end of it before it bounced through to Costel Pantilimon. No great surprise after the amount of precipitation we have just seen, but the pitch is looking very soggy indeed. No puddles, but still a bit of splashing around in some places. After a quick team-huddle from the Watford players, Sunderland get us started. The players are out on the pitch...that snow has turned to freezing cold rain. Sometimes it is all very clear at the start of the season, then after - when we are improving, are comfortable in the table with good feelings - sometimes the mentality of the players is to go very quickly on to other objectives. So for me it is very important to keep the focus. It is important to keep humble. We need to win this game to put together a run of four wins in eight games which will reap us 12 points and would be a fantastic start for me. It would be a fantastic achievement to get us out of the trouble we were in and 15 points from 16 games would be a massive, massive achievement in terms of where we've started from. Watford also make one change from the team that beat Norwich last week. Almen Abdi replaces Ikechi Anya in the Hornets midfield. Watford: Gomes, Nyom, Cathcart, Britos, Ake, Capoue, Watson, Abdi, Deeney, Jurado, Ighalo. Subs: Arlauskis, Paredes, Guedioura, Berghuis, Anya, Diamanti, Oulare. Sunderland make one change from the side that lost at Arsenal last week - Younes Kaboul is unwell so Billy Jones fills in at centre-half. The Black Cats also have striker Jermain Defoe fit again after a hamstring problem - he is on the bench. Subs: Mannone, Rodwell, Johnson, Matthews, Lens, Defoe, Graham. Speaking of Lawro, he is going for a 1-1 draw at the Stadium of Light today, but he has been impressed by Watford boss Quique Sanchez Flores. Lawro says: "Quique Flores signed all of those players in the summer, he'd never managed in the Premier League but has managed to find a very good side really early. "The form of Odion Ighalo and Troy Deeney is the icing on the cake. Igahlo looks a real athlete. I think they'll be absolutely fine in the Premier League, Watford. Not a problem." Where is Niall Quinn when you need him? Yep, the sky is very dark above the Stadium of Light and is currently emptying its entire contents on to the pitch. It started off as rain, turned to sleet and is now snow. Hello, I hope you've wrapped up warm - this is going to be a very wet, and cold, afternoon. Welcome to our live page for Sunderland v Watford. We’ll have text commentary here from 14:30 GMT. You can keep up to date with all the build-up to today’s games here.